Its a KMC, its a chain. These are the only chains I fit now, as not too keen on Shimano, and I had a spell of snapping SRAM chains. Maybe Im unlucky, but all issues went away when I fitted KMC 6 months ago. Recommended. Cant go wrong with KMC chains, easy to fit and long lasting. Great chains, not the lightest but durable and easy to fit with the quicklink. As always Merlin ship promptly and offer realistic prices. Good chain. The Missing Link makes it a breeze to install. KMC. Best chains I have ever used. KMC makes quality chains. Got these to replace previous KMC 11 speed chain that was 0.5% worn after 2500 miles. Great chain for the money, using in XT drivetrain in preference to the Shimano chains. Last well, and not fussy about orientation when installing. These chains are the real deal. I love how well they just work. Had some longevity problems lately with Shimano chains so went over to KMC. These shift the same and seem to be lasting better. I bought this chain to keep as a spare in case of any problems with my current chain. The chain that I am currently using is a KMC and so far it is working perfectly. Great chain and a good price from Merlin. Does the job! I am a NEW BELIEVER in KMC chains!!!! After having Shimano chains for donkeys years, these KMC chains are my new go to chain. Love the smooth gear changing and the quick link is easy and very effective. At Merlin Cycles price I fit a new chain every 4000 kms for the most cost effective cycling saving wear and tare on the drive-train!! Brilliant chain - flawless and quiet shifting; just what I expect from KMC chains and this is no different. Been running them on all my bikes for the best part of twenty years with no issues. Need I say more. Better and cheaper than Ultegra chains. Works well with Ultegra 6800. Have Ultegra Di2 and previous chain was quite worn. This wouldn't shift properly to start with, swapped cassette and had to re-align mech hanger, along with removing all the factory wax/grease from the chain. Shifts perfectly now so no problems and would recommend, chain link is super easy to fit. Works well with shimano cassette. Really like the chain link system. Makes fitting very easy. This KMC chain (with 'Missing Link' connector) hits the sweet spot for cost/quality. Keen pricing from Merlin allows for regular and quick chain swap-outs/rotations to keep drivetrains in top order and maximize life..
Exellent chain have had 2 of these before much smoother and stronger than Shimano and Sram chains shifts better up the cassette. Wouldn't use anything other than KMC chains. Great price from Merlin yet again !! My preferred chain. I'll always use these over the others on the market, easier to install and longer lasting. Best chain out in the market. My second KMC X11-93 chain. This chain is durable and silent working. Good, 45 km, much better than shimano 105 11s. I can recommend it with pleasure. This shop has the best priceI have ever seen!!!! 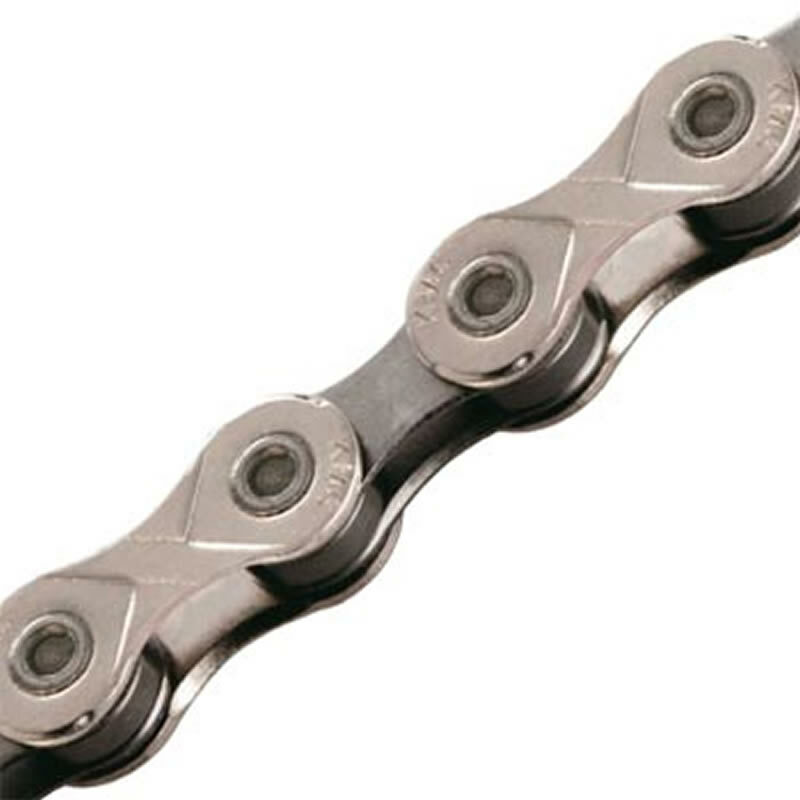 I have started using the 93 series chains in both 10 and 11 speed in all my bikes as I reckon they offer just about the best value for quality v price. I can't say I notice much of a difference between this and other brands and given the high mileage I do there is no way I am spending 2-3 times as much just on a chain. Downside to this and other 11 speed chains that I have used is that they wear way too quick for my liking. I always change at .75mm stretch if I can to try and avoid changing the cassette and have had less than 900 miles on one I've just replaced on a gravel bike. It had been through the Dirty Reiver to be fair but that's still quick wear. Competitively priced & smooth quiet gear changes. Another good quality chain from KMC. Easy to fit with the quick link. I've been using KMC chains successfully for longer than I care to admit. Its a well known "secret" within the bike industry that KMC manufactures chains for all the biggest names that you can pay significantly more for. I am going thru chains every few months so I really appreciate the value KMC provides. Highly recommended! I prefer these to Ultegra native 11spd chains. Runs a little quieter for me, and comes with a KMC Missing Link. Quality KMC product and very rapid delivery to Australia. I've never had any problems with the many KMC Chains I've used. The KMC X11-93 is probably the best bang for your buck when it comes to 11 speed chains. The durability of this chain is excellent. I prefer to buy a chain from someone who specialises in the production of chains. KMC has never let me down in the sense of a snapped chain. The gear changing is as good as any other. As for wear rates, I think there are so many variables I can't see how people can compare? So far great chain. The full plated KMC chain I wanted was out of stock. Shifts perfect. Just have to look after it as can rust. Well packaged, no frills chain that does the job. But it is noisy. I'm running this on a Shimano 105 groupset which is fairly new (3000 miles) I keep thinking the chain needs lubing due to the noise. Includes a connector. This chain is beautiful. Works perfectly with my campagnolo record 11 speed groupset despite using a shimano 105 cassette (don't tell anyone). As for the longevity, time will tell but this is my fourth KMC chain across 3 bikes in 3 years. They never seem to stop working. Fantastic - easy to fit and "quiet as a mouse". Had a few KMC chains good value and easy to fit. Using on my Ultegra set up and works well. It's a chain, fairly essential really as you need something to join the pedally bit to the geary bit. This one is shiny, quiet and far cheaper than the campag one the bike came with. A sram type joining link made it easy to fit. Simply the best value chain, in terms of price, performance and longevity. No frills 11sp chain, works every time.